Calling all Delta Residents you now have your very own Craft Brewery! Run out and check them out! 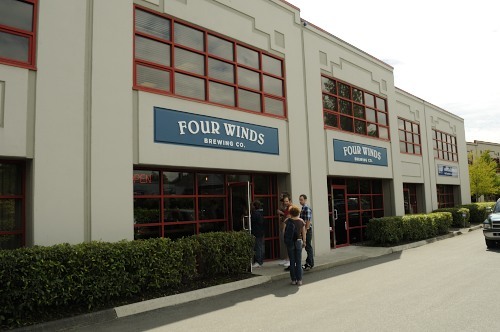 On June 1st 2013 the brand new Four Winds Brewing Company opened its doors to the public. Located in South Delta it is a prime location for people that also live in Richmond and Tsawwassen. On opening they had 6 draft beer and one cask beer for sampling. The staple beers were a Pale Ale, India Pale Ale and Saison. The seasonal beers were Smoked Porter, Wit Bier and a Wild Flower Saison and the cask was an IPA with Douglas Fir. Currently the only way to purchase their beer is at the brewery using Growlers (1.89L) bottle and a Boston Round or Mini Growler (1L). Bombers will be available in the near future (Rumor was July). Current prices are $11.5 for a growler fill, $5 for a glass or beer or $5 for a flight of 4 beer. A new Growler bottle is $5 and they will fill anyone’s growlers not just their own. From what I have tried so far I can tell this will be a great new addition to our local brewing landscape. I look forward to coming back and talking with the Brewmaster and the staff at the brewery as it was a mad house for the opening! Keep up the good work guys. Do yourself a favour and take a drive, taxi or bus to the brewery and enjoy their wonderful beer! This entry was posted in Brewery and tagged bc, beer, brewery, canada, delta, four winds brewing, india pale ale, IPA, ipa with douglas fir, pale ale, saison, smoked porter, south delta, wild flower saison, wit bier.